Puddleduck Grange: And That's a Wrap! I refuse to spend another season barking mad! I have realized none of the antics around me have anything "really" to do wilh, as a result of or fixable by me! It's not about ME! Writing those words are very bold for someone who feels the need to right the wrongs and sprinkle happy dust. I'm wore out! Spectacles Crane, loves to use the cast iron peeler! His happy memories I suppose. I dislike peeling anything, so this pie, with a helpful peeler ( grinning) is happening! I do love learning from my library of mistakes, and the next one will be perfect! Nana's new fav! Screwing with us and was outside more often! To remind myself, nothing is forever, well above ground anyway, I have photo proof Mother Nature can be as kind as she is cruel! Up, up, up pushing my lovely bike all the way. I couldn't show off like the much younger Spectacules Crane! As I gasped for breath, I sent him onward to investigate. Love to see Frier Tuck with a beverage right about now! My imagination was proven more entertaining, nothing to see at the top. Once my vittales returned, the flash DOWN! was worth every pulpatation! This September is ending once again and the Orange October is bubbling ahead! Hallow Celebrations will mend the soulless, thrill girlie ghouls , tantalize rigamortous! Thank you for the FUN Filled Summer, I am deeply grateful. 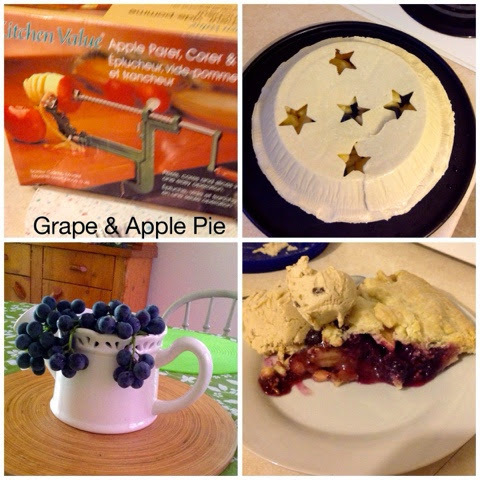 Any blog post that features pie is a classy post! I love the autumnal leaves; you got some lovely photos. Worth the pedling! Yes, October is almost here, and I thought, if I want to do something in 2014, better start soon! Hugs! 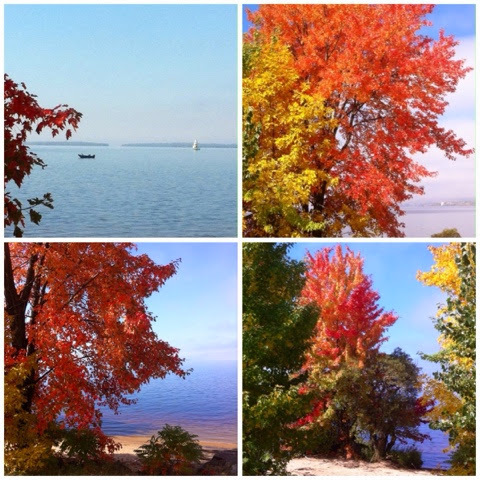 Oh what spectacular Autumnal photos - just magnificent and so close to the sea. You live in a beautiful part of the world like me. So very lucky! Our wee bikes are not made for hills since they have no gears! But you are a tough cookie and made it! Ahhh yes what a lovely Indian summer we had, but alas, it seems the bright Autumn colours will begin to fade now and we will be getting bare trees and wet leaves on the ground! Oh the the curse of mothers, trying to make everyone around them feel happy. I hope you yourself are feeling happy. The pie looks delicious, a perfect fall treat. But peeling grapes, I really couldn't be fussed. Lucky you having Mr Crane on hand. The weather here in the UK is bonkers, it is wonderfully warm for August. 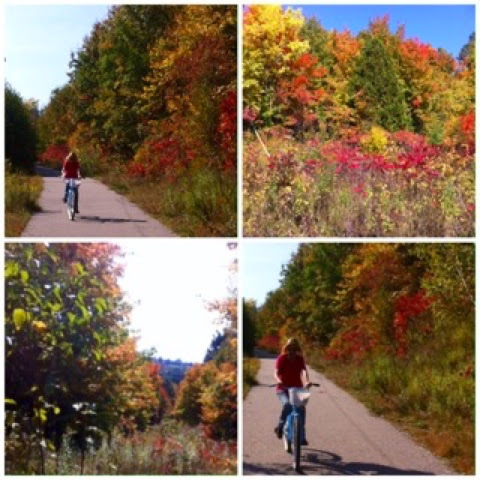 The tree colours on your bike ride are a splendid sight. Realizing that all the psychotic monkeys belong to someone else's circus is one of the best feelings ever. So bake on! I'm trying not to lick my screen right now, just so you know. And have I told you how much I ADORE your bicycling pictures? And with those gorgeous Autumn kissed trees, too? Precious! Oooh, I have a bad habit of reading posts before bed, telling myself I'll comment in the morning, and then forgetting to do so.